Intel Labs is the research division of Intel Corporation that advances the corporation’s research efforts within its corporate labs and partner research institutions, as well as through partnerships with private research contractors. Research topics cover a wide range of topics from sustainability to visual computing. Its stated aim is to make life easier, more enjoyable and more productive. Intel Labs informs its parent company’s growth by predicting the technologies of the future. Intel Labs is reinventing the desktop computer and envisions three-dimensional floating image technology as an innovative improvement over current digital interactions, and has directed a significant amount of its research efforts towards 3D content creation and interaction. In particular, Intel Labs is exploring the feasibility of generating 3D floating content that can be used with a traditional keyboard and mouse. At the time of initial contact, the company had performed extensive research into volumetric images, but was failing to consolidate research findings into a functional prototype. Because MistyWest had previously made the world’s first interactive tabletop holographic display for Vancouver-based company called H+ Technology, Intel Labs naturally sought out MistyWest’s expertise. 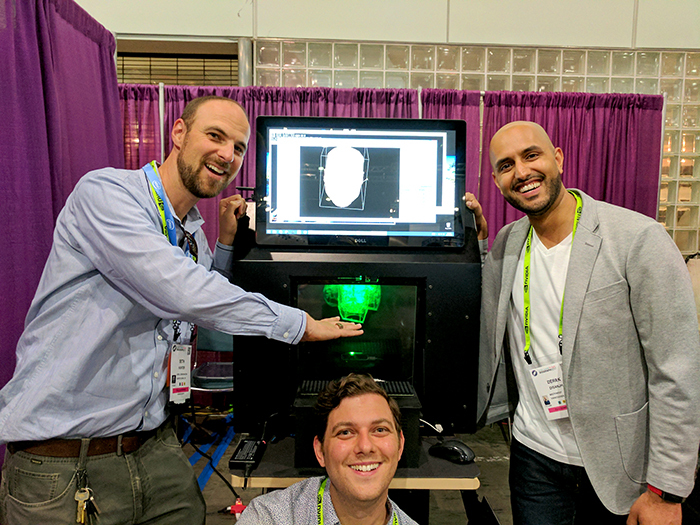 Their primary objective was to troubleshoot the problems with their existing prototype, in addition to developing an iteration of a functional prototype that showed the viability of this volumetric image creation technology, and produce a compelling experience that would generate interest in further development. How do you create a compelling floating volumetric image/hologram that can be used on a desktop, given current technical constraints, and commercial available hardware? The work that MistyWest did for Intel Labs can be broadly categorized into three phases: Research, Experimentation and Prototyping. Research: Is this even possible? Internally, Intel Labs had been exploring volumetric re-imaging using high frame-rate projection onto a rotating helix. 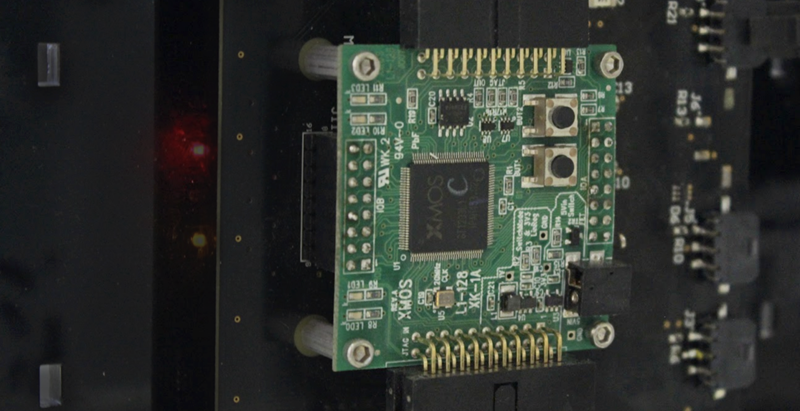 MistyWest complemented this research by aiding the understanding of the technical possibilities of 3D volumetric displays, exploring the user experience, and defining low-level chipset requirements. The prototypes that Intel Labs had produced at the time had limitations on image projection, image quality, noise, and size. As such, MistyWest did extensive conceptual research into the framework that Intel Labs had built and was able to present the client with software architecture alternatives. Experimentation: Testing out the hypothesis. Basing off of the discoveries in the previous phase, MistyWest performed experimental software development towards the demonstration of streaming content, and designed, fabricated and assembled a swept volume display prototype, of which included mechanical integration of an optical system, a glass positioning sensor and light-protected enclosure. At the end of the experimentation phase, our Westies had developed a prototype that included a high frame-rate projector, novel mechanics and electronics, and an innovative content generation pipeline. Prototyping: Let’s add cool features to this. Having proven that 3D image creation was possible, the next steps involved improving image quality, exploring animation features and researching possibilities for human-object interaction. 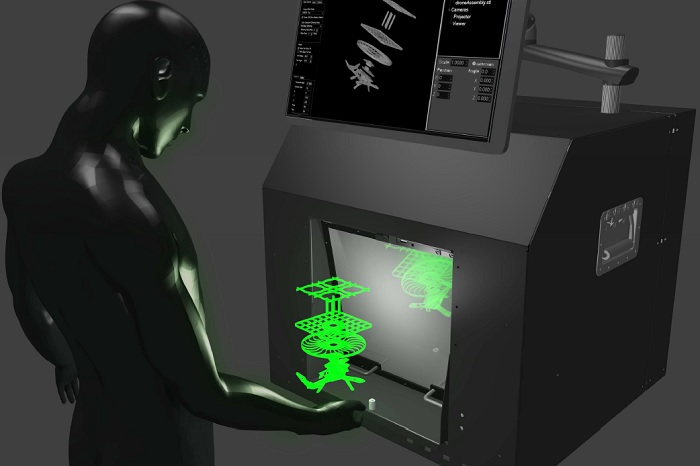 The experimental prototype produced by MistyWest was capable of producing stationary, monochromatic green images. Up until that point, integrating RBG colour had been attempted by one team using 3DMDs (3D Mech Designs). To implement colour using this same technique, but with 1DMD, meant increasing the rotation three times; a move that could jeopardize the stability of the system. Compounding this problem were constraints posed by the speed of rendering and CPU processing. By using a larger rendering volume and a high tolerance aluminum system, MistyWest was able to remove the jitter due to petal tolerance. The goals of this project were not only met, but exceeded original success metrics, which only included proof of feasibility and not the delivery of a fully functioning prototype. It was co-presented by Intel Labs & MistyWest at SIGGRAPH 2017.